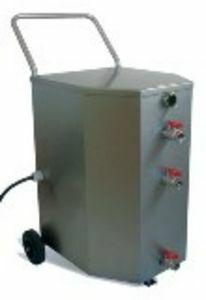 The mobile heating-unit type HW (open water system) is designed for the quick preparation of hot water, offered in three variations: 9,0kW, 18,0kW and 24kW. The HW units are equipped with an integrated pump (capacity 2,8 m³ by 3 bar) and integrated water tank (80 l). Additionally: Outlet temperature regulation, dry-run protection, pressure monitoring, wheels. The HW units can be easily connected to a tank. Thanks to their stainless steel construction they are specially suited to operation in a humid environment such as the wine-cellar. 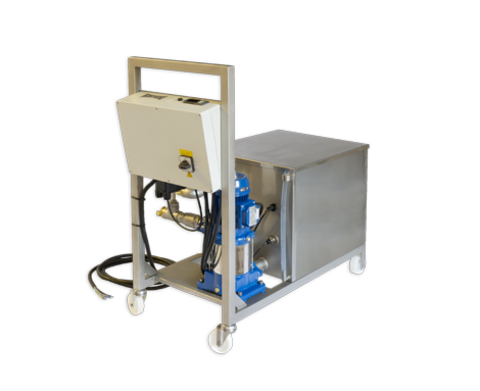 These hot-water devices are the ideal solution for wineries, breweries and cideries without flowing hot water, or where the targeted heating of single tanks is required.